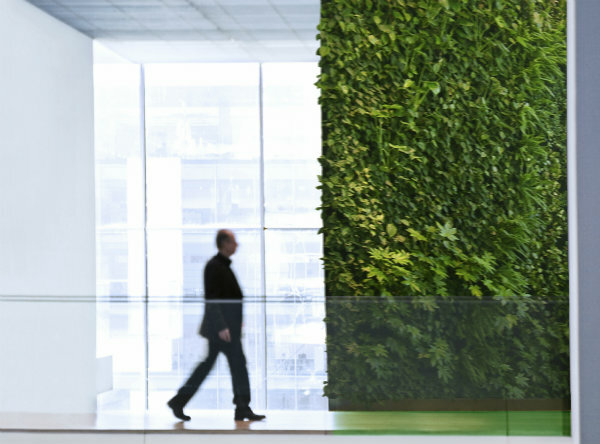 A green vertical wall at the office? Three reasons why you should get one! Home / Going Green / A green vertical wall? We here at Najell just love the idea of an indoor vertical garden. The benefits are plentiful. Here is a short list of why we love them. We just have to find a way to get this green vertical wall into our office and homes. The plants in the green vertical wall improve air quality by absorbing pollutants everywhere around us. Also, all our green friends take in carbon dioxide and release oxygen making the air more breathable making us feel more awake and alert. The plants also actively attract dust reducing the particulate levels by up to 20%. Indoor green vertical walls also regulate humidity and work as humidifiers and de-humidifiers making your environment have just the right humidity. Offices are often times located in central areas with lots of people moving around and cars, trucks, buses and other means of transportation making a lot of noise. This creates more stress than we realize. Plants in general and even more specifically the green walls create a more relaxing area by absorbing noise and reducing the after-vibrations of a sound. Previous post: Is augmented reality what will save the parks? Next post: Parents – set high standards!